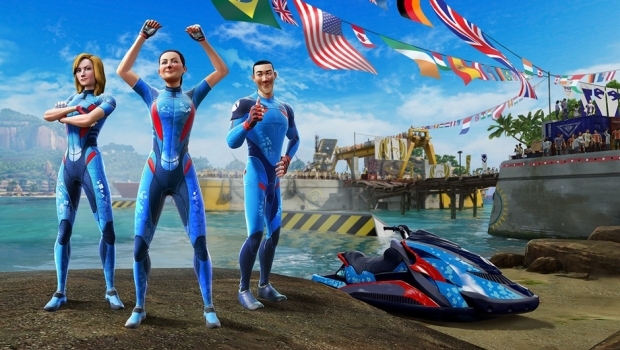 Starting Saturday, Feb. 1, players can compete to represent their country on the in-game national and international leaderboards by setting the best race time for their country and the world. When the challenge wraps on Friday, Feb. 28, the best contestant will be crowned the world champion and will receive a gold-encrusted wake racer. Additionally, everyone who sets the best time in their country will be rewarded for being a national champion and will get a silver-encrusted wake racer as a runner-up prize. Finally, to honor the nation that the world champion competed in, all the players from the winning country can celebrate by unlocking a special wake racer inspired by that country’s flag. There are also daily challenges for everyone to earn points and unlock prizes that are only available during February. All prizes will lead to eternal bragging rights when the winner takes these exclusives into the full game of “Kinect Sports Rivals” when it launches. New players can join the “Kinect Sports Rivals” Preseason International Champions fun by downloading the free trial experience through Xbox Live Dashboard on your console or via Xbox.com. To participate in the “Kinect Sports Rivals” Preseason International Champions and claim your place on top of the leaderboards, you must download the “Kinect Sports Rivals” Hub, a companion app that features these challenges, leaderboards, and prizes via Xbox.com. Kinect Sports Rivals are launching in spring of 2014 and will bring us all new motion control-based family fun to the Xbox One. With over a million players on the demo alone, it looks like this game will be a hit.